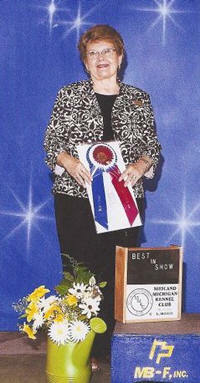 This multi-group judge has seen the dog show sport from inside and outside of the show ring. Gammill says, opinions count! There are too many opinions today. Many have no verification or fall within a grey area. Expectations of a judge, exhibitor or breeder may differ but we all have them. Asked how one could be successful, Dale Carnegie replied. “I cannot tell you how to succeed. I can tell you how to fail. Try to please everyone!” Considering both sides of an issue is imperative but compromise can be a two-edged sword. Did you start with a “stellar” dog? Some exhibits “catch fire” and some don’t. Either way, a judge should give and expect courtesy. Judges put themselves out there after years of study (and exorbitant expense) to judge breeds to their individual standard. Therefore, they should be respected for their efforts and for their studied opinion. When the judge’s opinion doesn’t suit the exhibitor, stomping off doesn’t improve the situation. Such behavior could result in a bench show committee. Ringside opinions contribute little when someone does not have their hands on the dog. Criticism directed toward the officiating judge who is attempting to follow proper ring procedure, stay on time, evaluate, prioritize each dog, consider disqualifications, and mark the book correctly is unprofessional at best and at worst, grossly unfair. Should judges continue to exhibit their own dog? Opinions vary there too. Once one decides to be a judge, standing ringside with exhibitors may lead to criticism. By applying to judge, the applicant puts him/herself in this position and must make a personal choice based on knowledge and his/her opinion on that day. On the other hand, if the officiating judge rewards your dog, although it may be the best one, some people may consider the win “political”. 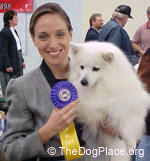 If the judge doesn’t reward your dog, in your opinion, that judge may be considered inept. You have the right to show your dog, but your opinion of the results, good or bad, is best kept to yourself. Do Breed Standards change? No, type does. What is type change? It is when through breeding, faults or virtues become so intensified or common place they eventually are considered a virtue. For a while it wins and catches the eye, but eventually that “type” fades and another takes it place. 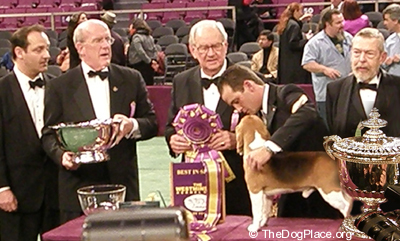 In the interim, breeders show dogs that appear “different” and opinions being what they are, those dogs are either awarded or penalized for their correctness. Proof is that several breeds have been “derailed” but are now back on track. This reflects changing opinions on what is correct but the important thing is to breed and judge to the standard, thus allowing each dog to perform the duties for which it was intended. If the breeders cannot comprehend what their breed needs, woe be to them. To award a dog because “the breed needs it” contradicts the standard. Many dogs are dominant for certain desirable traits. Today we have the opportunity to see even more Champions because the Select Class opens the door to forgotten stud opportunities and successful pedigrees. Hidden virtues are just around the corner. When one applies to judge, should they have some understanding of structure and corresponding movement? Shouldn’t they be able to identify body shape, top lines, breed specific movement, and size differences? Unfortunately, that’s not always the case. Often breeders watching from ringside know as much, if not more, than the officiating judge. Judging opinions can change with the weather but Breed Standards (thankfully) do not. It is very important that a judge differentiates between breeds and judges each breed according to its own breed standard and not to place emphasis on virtues and faults according to the criteria with which the judge is most familiar. Do breeder judges judge pieces? Do all-around judges "judge dogs"? Alternating between all-around judges and specialty judges at Nationals could keep our breeds from falling off the cliff of good intentions. Breeds need to have balance between type and soundness, NOT just front and rear! Adjusting one end to compliment the other does not make a good dog. It results in a dog that does nothing wrong, but neither does it do anything right. Some dogs are not correct to standard but they are “fixers”. Breeders need such dogs as they can improve breed type, pass on virtues and eliminate faults. However, it is NOT a judge’s responsibility to award wins for this reason. The judge’s responsibility is to judge to standard and to not inflict personal opinions on a breed, even if they are correct. It’s sad we can’t discuss faults and virtues without offending someone. Having learned more from bad horses and dogs than good ones, I have a template of the standard burned in my mind and it greatly approaches the “greats” of any breed. However, seeing “good and bad” side by side opens the eyes. There are three types. #1. True breed type (the standard) #2. Preferred breed type (flavor of the month) #3. Hot damn! It wins! Who cares, breed more of them. What’s your opinion? Which stage is your breed in? Some judges can articulate why they put one dog over another. Others can find a good dog, but cannot articulate their choice. Having an “eye” is a great gift. Opinions, like arm pits are many and diversified but it is the glue that holds our sport together. The sport of dogs is a non-ending learning experience. So be kind to each other, breeders and exhibitors. Judging is as tough as breeding but it is done in the eye of public opinion. Before making a judgment, picture yourself in that ring, working to select the best of the best while others take measure of your expertise. Your opinion could well match the judge’s when its all said and done.